By Aisling Rafferty | November 25, 2014. 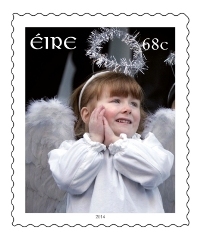 Local girl Paris Curtis has become the youngest person ever to feature on a stamp in Ireland. Paris, who is currently a student in Marist National School, Crumlin said she was “super excited” to be featured on An Post Christmas stamp for this year. Paris’ grandmother Theresa Curtis said the family would send the stamp to family overseas in Australia and America. An Post has released two other Christmas themed stamps, featuring images of stained glass windows created by Harry Clarke. Finding, choosing and commissioning the stamps, which will cost 68c, has been a yearlong process for An Post. This is the 28th year An Post has released new Christmas stamps to mark their busiest time of year. Spokesperson Ann McHugh has urged people again this year to post letters and parcels early to avoid disappointment. The last posting date for standard delivery to the Republic and Northern Ireland is 20 Dec, 19 Dec for Europe and Great Britain and the 11 Dec for the USA.